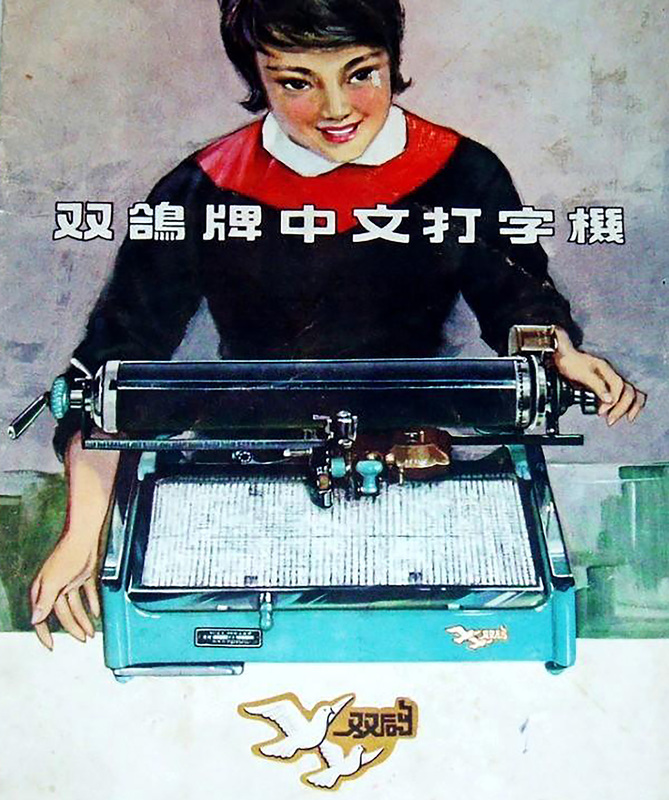 An illustration for the Double Pigeon Chinese typewriter manual, 1989. This article was first published by Language Log. For those of us who teach and research the Chinese language, it is often difficult to describe how the Chinese characters function in conveying meaning and sound, and it’s always a particular challenge to explain how the writing system differs from the alphabetic systems we are more familiar with. The issues are complex and multi-layered, and have important implications for basic literacy and the teaching of Chinese to both native speakers and foreign learners. Recently Tom Mullaney, a professor of history at Stanford University, has been muddying these pedagogical waters in a series of articles and interviews that seriously misrepresent the merits and relative advantages of the alphabet over the Chinese script. Mullaney’s recent article in Foreign Policy (republished by ChinaFile) was one that particularly caught my eye. The problems with the article start with the title: “Chinese is Not a Backward Language,” which raises a red flag at the outset. For any scholar of the Chinese language, the question immediately arises: “Chinese language or Chinese script?” The two are not synonymous, after all. Reviewing the article, it is obvious that Mullaney constantly conflates, confuses, or ignores the distinction between the two. Sometimes the conflation seems careless and unintentional, but at other times I suspect that he blurs the line intentionally to bolster the straw-man argument of his piece: namely that criticisms of the Chinese characters are part of a lingering racist, “Orientalist” prejudice against the Chinese language, and by extension, Chinese culture itself. The great irony of Orientalism 2.0 is that Chinese characters are not only going strong in the 21st century, but they are one of the fastest, most widespread, and successful languages [sic] of the digital age. The Taiwanese QWERTY keyboard has ‘zhuyin,’ ‘cangjie,’ and ‘dayi’ key labels, as well as the U.S. Latin-based ones. First of all, one has to take issue with his claims about the attacks against Chinese. Exactly who is saying that Chinese is a backward language? For the record, no reputable contemporary scholars are espousing anything like this claim, which is why Mullaney has to go back to Hegel and Social Darwinism for his examples. One can, however, find plenty of reputable linguists and experts who have much to say about the problems with the Chinese script, and many of these problems are still with us despite the relatively successful adoption of characters into cyberspace. But the claim that the Chinese language itself is under assault from chauvinistic Western linguists is a much starker and more sensationalist narrative that draws more media attention and re-tweets. Second, the fact that Chinese script has a major presence on the Internet is no proof that historical criticisms of the inefficiency of the Chinese script were somehow invalid. After all, it took a massive, concerted effort on the part of computer programmers for more than two decades to put Chinese character input on a par with that of alphabetic systems. And despite the exciting new advances in character entry that Mullaney mentions, even now the most common input methods (straightforward pinyin, wubi entry, etc.) are still cumbersome in comparison with typing in alphabetic text. (Pinyin or handwriting input on a smart phone or pad still generally involves a two-step process, in which the user must choose the correct character candidate from a pop-up menu.) Mullaney seems to assume that, because modern computer science has come up with workable, workaround solutions to the problem of digitizing Chinese characters, there evidently was no problem to begin with! If anything, Chinese conquered the alphabet, not the other way around…. In the Western world—or really in the “Alphabetic World”—we use the computer keyboard in a dumb,< em>what-you-type-is-what-you-get kind of way. In all but rare instances, we assume a one-to-one correspondence between the symbols on the keys we strike and the symbols that we want to appear on the screen. Press the button marked ‘Q’ and ‘Q’ appears. It’s just that simple…. Chinese “input” uses the QWERTY keyboard in an entirely different manner. In China, the QWERTY keyboard is “smart,” in the sense that it makes full use of modern-day computer power to augment and accelerate the input process…. [T]he Latin alphabetic world has spent more than two centuries congratulating itself for “Our Glorious Alphabet,” and yet at the same time has done far less to explore and push the Latin alphabet to its fullest potential. It is an odd contention that a writing system that still mostly relies on alphabetic input methods has somehow “conquered the alphabet,” but put that aside for a moment. There is some dubious characterization here, as well as subtly misleading use of the words “dumb” and “smart” to contrast the two systems. Mullaney seems to assume that computer keyboards always possessed these inherent “smart” capabilities, but the smug, complacent users of the plodding alphabetic script were unable to bring these functions into “full use.” But this is sheer nonsense. Mullaney is obviously right that the increased functionality of the traditional keyboard that came as a result of techniques developed to process Chinese characters is also a boon to input of alphabetic languages, as well. But again, this “smart” functionality of the computer keyboard was the result of decades of very hard work and ingenuity, as computer programmers had to struggle mightily to figure out a way to input thousands of complex graphs using only the limited key set of the QWERTY keyboard. The expansion of computer power he refers to was a hard-won solution to the very real problem of dealing with a Chinese writing system whose component symbols were a crippling burden on human memory and computer memories of the 1980s and ’90s. For those of us who struggled through this development phase, rooting for the breakthroughs that would make character entry on the computer faster and more intuitive, this historical amnesia is simply baffling. Mullaney’s reversal of logic can be made clearer with analogy to the legendary inadequacies of English spelling. Scholars for generations have bemoaned the state of English orthography, noting that the system is riddled with inconsistent spellings in words such as through, though, rough, bough, cough, etc. There were multiple schemes for completely overhauling the spelling rules of English to make the conventions more efficient and consistent, as are those of Spanish or German. Imagine, if you will, a writer who pooh-poohs these criticisms of English orthography, accusing critics of English spelling as “Anglophobes,” and crowing that “The great irony of this “Anglophobia” is that English orthography is not only going strong in the 21st century, but it is one of the fastest, most widespread, and successful languages [sic] of the digital age!” No one would seriously contend that the development of things like computer spell-checkers refutes the criticism that English orthography is seriously broken. If anything, the need for such technological fixes confirms the intrinsic drawbacks of the writing system. The use of pinyin as an add-on writing system employed to teach Chinese school kids the sounds of Putonghua. It is in some sense absurd that the poor overworked Chinese children must learn pinyin, an alphabetic writing system, in addition to the burdensome character system, in order to master basic reading skills in their own language. This is especially ironic, given that pinyin alone would be sufficient to achieve basic literacy, if only Chinese books were printed in this imported phonetic writing system. The “character amnesia” problem (in Chinese tibiwangzi), namely, the inability to recall how to write the graph for a sound due to memory overload. (Referenced in Language Log here, here, and here). This has been a problem for centuries, and made only worse now with the advent of the pinyin input method and voice messaging options on digital devices. The problem has gotten so bad among young people in China that Chinese state television has produced several TV shows such as Hanzi Yingxiong, “Chinese Character Heroes,” and Hanzi Tingxie Dahui, “Chinese Character Dictation Meeting,” in which middle school children compete in various character writing tasks, as a way of reviving the rapidly deteriorating skill of writing by hand. This character amnesia—ironically the result of relying on the less memory-intensive alphabetic pinyin input method!—results in much wasted time as users have to check their digital dictionaries to retrieve the forgotten graph, resort to pinyin—and, increasingly English!—or simply opt out of the system entirely, resorting to some kind of speech-to-text technology to get the right character on the screen. The enormous cognitive burden of the reading process, which is due to the dearth of phonetic information in the script. The relative lack of phonetic feedback for Chinese characters increases the difficulty of reading acquisition many fold, discourages non-native speakers—and even many native speakers—from even attempting to tackle the written language. Many perfectly intelligent ex-pats living in China make a very rational decision to eschew the written language altogether, realizing that the ratio of effort-to-effect is simply too abysmal. And in Singapore’s multilingual education system, Mandarin studies are increasingly shunned by ethnically Chinese students, in large part because the kids increasingly balk at the difficulty of memorizing Chinese characters. The problem has become so severe that the Singaporean government has set up a special agency, the Singapore Centre for Chinese Language (SCCL), to improve the effectiveness of teaching Mandarin in the schools. These are all daily frustrations that are simply not a part of the digital lives of citizens in the “Alphabetic World,” as Mullaney calls it. They are problems with the Chinese script that the world of Information Technology has not yet solved, and in many cases, has exacerbated. Mullaney wants us to believe that notions of the superiority of the phonetic alphabet as a writing system are merely smug, chauvinistic prejudices of the West, but his evoking of this trendy cultural trope obscures the real pedagogical and informational challenges still presented by the Chinese script. Alphabets still hold enormous informational and ergonomic advantages over the Chinese writing system, and Mullaney seems to totally ignore these considerations. Finally, there is Mullaney’s contention that critics who consider Chinese characters unsuitable for cyberspace are exhibiting vestiges of Orientalism, colonialism, and even racism. This is a talking point that has garnered much media attention, even in the Chinese-language press. Yet such claims exhibit an astonishing indifference to historical reality. Surely Mullaney is aware that the fiercest critics of the Chinese writing system were not foreigners, but the Chinese themselves. May Fourth intellectuals such as Chen Duxiu and Guo Moruo advocated the eventual abolition of Chinese characters, and even China’s most famous modern writer, Lu Xun, was quoted as saying “If the Chinese characters are not eliminated, China is doomed.” Were these patriotic May Fourth Chinese guilty of racism, or colonialist thinking? Chinese characters are so difficult to learn that even the best system of rudimentary characters, or simplified teaching, does not equip the people with a really efficient and rich vocabulary. Sooner or later, we believe, we will have to abandon characters altogether, if we are to create a new social culture in which the masses fully participate. Do these remarks reveal that Mao thought that Chinese was a “backward language”? Was he exhibiting a form of Orientalist thinking? Or was he merely expressing a pragmatic acknowledgement that the characters were an enormous stumbling block to universal literacy? Despite Mullaney’s starry-eyed claims, the advanced, multi-functional Chinese input methods have not miraculously solved all the problems associated with Chinese script. Computer technology has indeed made great strides in solving the problem of character entry, putting alphabets and Chinese characters on more-or-less the same footing. Yet educators, publishers, websites, and software developers still struggle with the same kinds of inefficiencies and added burdens that have always plagued the writing system. The calls for alphabetization of the Chinese language were quite reasonable and valid throughout most of the 20th century. Only in the last three decades has this changed. Make no mistake: The incorporation of Chinese characters into modern cyberspace is not proof that the calls for their abolition were merely misguided prejudice; rather, one could make the case that modern IT technology that has saved the characters from almost certain obsolescence in the increasingly interconnected and complex 21st century. Note that it is not my contention—nor that of any serious scholar I’ve ever read—that the Chinese script is “backward.” This is simply not a sensible or productive category in linguistics, and Mullaney’s evoking of this culturally loaded term is an annoying distraction. The Chinese script is a marvelously complex, rich, and sophisticated cultural product, one that has its own semiotic dynamism and esthetic beauty, as well as its informational strengths and weaknesses as a writing system. As such, it should be approached and evaluated on the basis of all the relevant practical considerations, and not as an excuse to engage in rhetorical displays of political correctness. Chinese characters may have a bright future, as Mullaney suggests, but the stubborn reality of their continuing cognitive and ergonomic disadvantages require clear-headed, scientific solutions, not headline-grabbing hype about nonexistent culture clashes. We should pool our knowledge and our digital resources to tackle the very real problems of learning to read and write Chinese characters—and not merely pretend that such problems are a mirage brought on by Western delusions of cultural superiority.